The announcement that the two sides would sit down for the first time in nearly a week didn’t indicate whether any new contract offers would be on the table. “After 21 months of negotiations I think it would be an unrealistic expectation to say that this is going to be over after today because there are hard issues to work through,” said Alex Caputo-Pearl, president of United Teachers Los Angeles. With state funding dependent on attendance, student absences cost the district about $97 million over four days, the district said. At the same time, it doesn’t have to spend about $10 million a day on teacher pay. The union representing principals urged LA Unified to close schools until the strike is over. 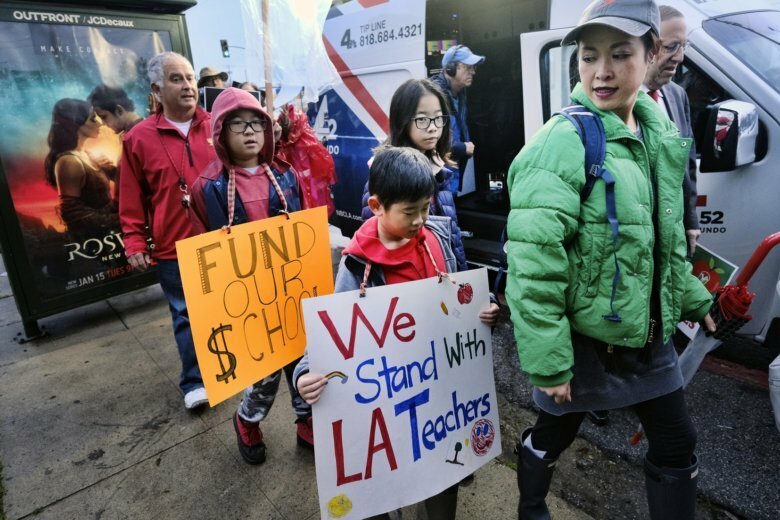 If the district can’t close the campuses, Associated Administrators of Los Angeles asked for additional resources for principals who have helped keep schools running while teachers walk picket lines. The union rejected the district’s latest offer to hire nearly 1,200 teachers, counselors, nurses and librarians and to reduce class sizes by two students. It also included a previously proposed 6 percent raise over the first two years of a three-year contract. The union wants a 6.5 percent hike at the start of a two-year contract. District officials have said teacher demands could bankrupt the school system. Superintendent Austin Beutner has urged the teachers to join him in pushing for more funding from the state, which provides 90 percent of the district’s money.